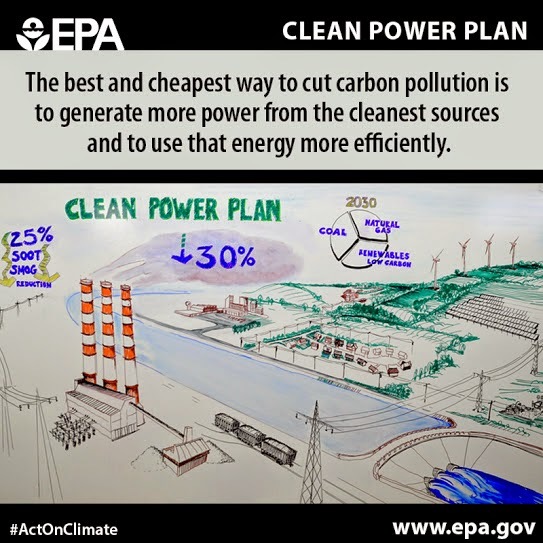 Graphics illustraing the core essense of the Clean Power Plan. Photo credit: U.S. Environmental Protection Agency. For the first time ever in US history, carbon pollution from existing coal power plants will now be regulated. regulating existing power plants, has now finally seen action as plans have been laid out for how this could be implemented. While it is still far off from what is required, it’s staggering as there is now, for the first time, a legal requirement being put in place for cutting carbon emissions. It could signal renewed hope that the world could agree a legally binding climate treaty in Paris next year. The emission rules were announced by the Environmental Protection Agency’s (EPA) administrator Gina McCarthy. In a statement regarding the Clean Power Plan, prior to signing the proposal, she said that it would cut emissions from the largest source of carbon emissions which is power plants. She also highlighted that each state has been looked at carefully and given different goals as the challenge to decarbonise the power sector varies from state to state. In core essence, what has been proposed will limit carbon emissions from the power sector with 30% in 2030 from 2005 levels. As the rules are already being attacked by conservatives as an anti job strategy and a war on coal, the EPA is framing it not only as a climate change issue but is saying the proposal will have enormous health benefits too and will reduce the money required on health care and save lives. It’s estimated that the net climate and health savings would be in the region of $48 to $82 billion. Perhaps to ease the scaremongering provoked by the Republicans it’s being manifested that power generation from coal and gas will remain dominant for decades to come with the two combined fossil fuels still representing 30% of power generation. The move has been welcomed by the largest environmental group in the US the Sierra Club. Large corporations like Mars Incorporated and Unilever are on a list of over 170 companies who are supporting the proposal. The group The Small Business Majority have also praised the announcement, saying it would help curb extreme weather and the economic harm it poses to small businesses. The Obama Administration, being aware of the onslaught and attack coming their way from conservatives and the estimated series of lawsuits that undoubtedly will follow, made a reference to when the Clean Air Act was established in 1963. Scaremongering tactics were, in this instance, also put forward claiming that those regulations would be a job killer. But instead the opposite happened, companies innovated and created growth. The Administration believes the same thing would happen with the Clean Power Act and said that it’s a probusiness proposal that will stimulate growth in the low carbon sector while providing large health cost savings. Thanks for sharing the information. Enjoyed reading it – Please can you read my no win no fee article and give me some feedback. Will highly your comments.